For the past two months we’ve been sharing information about testing for Black Belt in Grace Martial Arts. The smiles you see above are from our newest Yon Ch’uan Black Belts! They were students in our Tampa GMAF program until I moved to Alabama almost four years ago. They, along with several other students in the Lutz area, kept the class going at CrossPointe Family Church – 919 Debuel Rd in Lutz. The class meets Mondays at 6pm during the school year. The Tampa class had humble beginnings with one homeschool family in 2002 and grew to more than a hundred registered students at Seminole Heights Baptist Church on Monday evenings until our final class in September 2014. Hundreds of students came through our program during those 12 years and dozens tested for Black Belt. Several of our students continued the program in Lutz and others continued to teach community self-defense programs in the Seminole Heights area and at the University of South Florida. Grand Master Robert Xavier brought many of his Bradenton/Sarasota students up to Tampa and Lutz for several years to help our classes learn more about Yon Ch’uan Martial Arts and the importance of being a faithful follower of Jesus Christ. Our Tampa area program is so much stronger because of the support of GM Xavier and his Black Belt students. My thanks to everyone who has played a role in building and supporting this Christian martial arts program! It has been a real team effort. Nathan and Joshua Edgar and Mark Fisher led classes until Nathan left for college last year. Mark Fisher and Joshua Edgar have led classes since then. 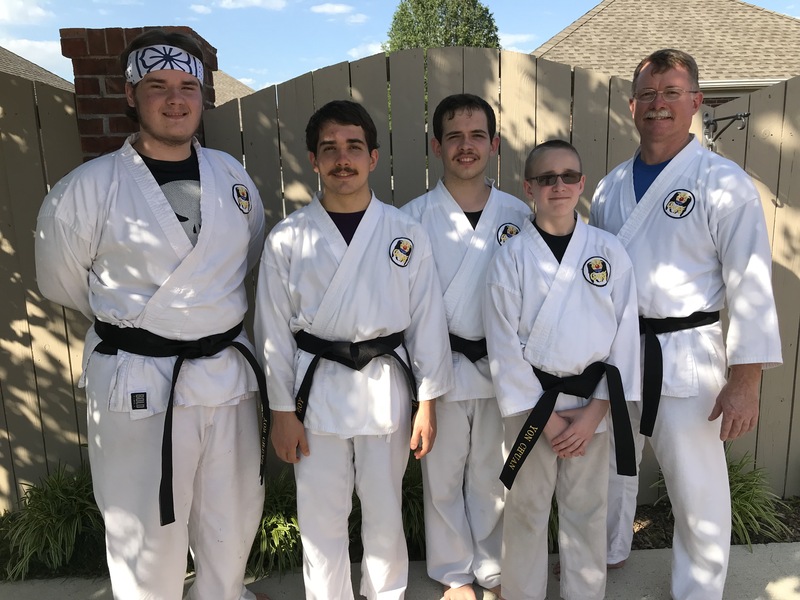 Our other Black Belt candidates, along with Sarah Edgar and Mike Olivo, have been a big help in keeping the class focused and moving toward the physical, mental, emotional and spiritual goals of the class. Sarah Edgar and her children joined Grace Martial Arts in 2004 and have been invaluable to the success of our Tampa program. Many wonderful opportunities came to us during the years in the Tampa area. One of them was training deaf children in Columbia, South America. The Edgar Family raised the funds and visited Columbia where they taught self defense and shared the Gospel of Christ with many in the deaf community there. And with Grand Master David Sgro and Go! Ministries in Guatemala and the Philippines. Two of the unique ways we’ve been able to stay connected since I moved to Alabama have been videos and Skype. Elijah Fisher shoots, edits and emails class videos to me every week during the school year. That has allowed me to observe student progress and give class feedback to our instructors on a regular basis. I have been able to teach a second-hour class through Skype to higher ranking students who were working toward their Black Belts. Elijah has done a great job handling the Skype sessions. We’ve even been able to be part of their graduation ceremonies through the years from hundreds of miles away thanks to Skype. Grand Master Xavier has met regularly with our Black Belt candidates in Lutz helping them prepare for their test. Below is a photo from several weeks ago of GM Xavier and his son Jonathan with four of the students who tested in Alabama this week. I will be forever thankful to “Mr. Bob” for his friendship and partnership in Grace Martial Arts for the past 20 years. We’re looking forward to many more years of friendship and ministry together. Congratulations to our new Black Belts and all of our students and their families.